Members of the Center for Youth Leadership (CYL) at Brien McMahon High School closed October as National Bullying Awareness Month with one of their popular hallway demonstrations. 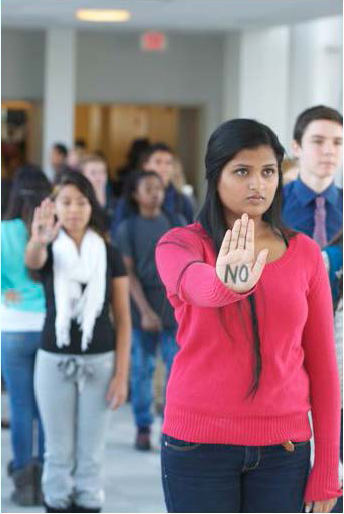 The point of the activity was to urge students to keep hallways at Brien McMahon High bully-free. CYL members know bullying happens everywhere in a building, but the hallways are tough for teachers and administrators to monitor because they are in their rooms and offices getting ready for the next class or a meeting. That’s where students come in. They strongly believe that students need to play a more prominent role in stopping hallway behavior that is mean or insulting or emotionally harmful. CYL members have similar demonstrations planned for the locker rooms, bathrooms and school buses. The Center for Youth Leadership is the largest youth activism organization in Fairfield County, and one of the largest in Connecticut. Our mission is to promote social change. The Center for Youth Leadership, which is based at Brien McMahon High School in Norwalk, was established in 1999 when six students asked for help in examining the connection between academic achievement and where students live in Norwalk. These and other initiatives led members of the Center for Youth Leadership to create a model of youth activism that they call socially engaged philanthropy. The Center for Youth Leadership, which has grown to 220 members, is the recipient of the Governor’s Educational Citizenship Award; the Night of the Child Award from Prevent Child Abuse Connecticut; the Volunteer Service Award from the United Way of Coastal Fairfield County; and the First for Kids Award from Connecticut Voices for Children. For more information, visit http://www.gocyl.org/.